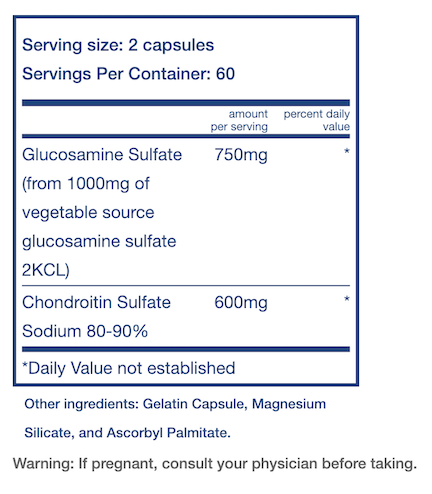 Click the button below to add the Glucosamine & Chondroitin (120ct) to your wish list. Glucosamine & Chondroitin Sulfate helps build and support collagen, the basic substance of cartilage and joints. * Both nutrients support the body’s ability to create and recreate connective tissue and help maintain healthy joint function. * Glucosamine and Chondroitin Sulfate are necessary for building the protein molecules responsible for giving cartilage its strength and resilience. * The glucosamine in this formula is vegetable-sourced, shellfish free, and non-GMO. Disclaimer: While we attempt to ensure that each and every product information is correct, from time to time manufacturers may alter or change their ingredient lists. Actual product packaging and materials may contain more and/or different information than that shown on our Web site, and written in our descriptions. We "strongly" recommend that you do not solely rely on the information presented on this website and that you always read the labels, warnings, and directions before using a product. Content on this site is for reference purposes and is not intended to substitute for advice given by a physician, pharmacist, or other licensed health-care professional. You should not use this information as self-diagnosis or for treating a health problem or disease. Contact your health-care provider immediately if you suspect that you have a medical problem. Information and statements regarding dietary supplements have not been evaluated by the Food and Drug Administration and are not intended to diagnose, treat, cure, or prevent any disease or health condition. Neuronutrition Associates assumes no liability for inaccuracies or misstatements about products.